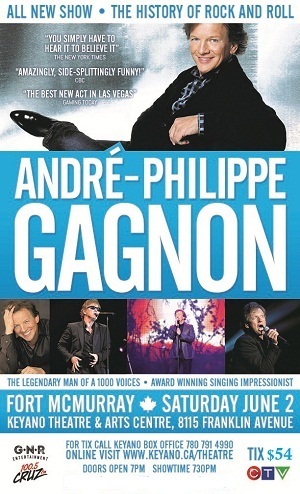 Andre Philippe Gagnon is the number one singing impressionist in the world today. Known as the man of a thousand voices, he has played to sold-out audiences around the world for over three decades. His impressions of famous personalities including Mick Jagger, John Lennon, Louis Armstrong, The Black Eyed Peas and even Fred Flintstone, are rapid-fire and amazingly spot-on. Gagnon can slip from Frank Sinatra to Pharrell Williams in the blink of an eye! Andre Philippe Gagnon is back with a brand new show called “The History of Rock and Roll”. It’s a musical journey through the soundtrack of our lives - from the fifties to today. Gagnon borrows the voices from all of the eras to create the musical history of the last six decades. His new show combines music, comedy, and multimedia to create an unforgettable night of entertainment! A must see for music and comedy fans alike. Keyano Box Office will only refund tickets for show cancellations or schedule changes (postponements). The Box Office requires the tickets and receipt of purchase before a refund is granted.